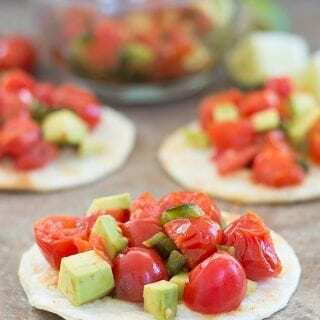 Quick and easy tomato salad made using Mexican ingredients like cayenne pepper and poblano peppers. Use it as a topping or for a light lunch salad. 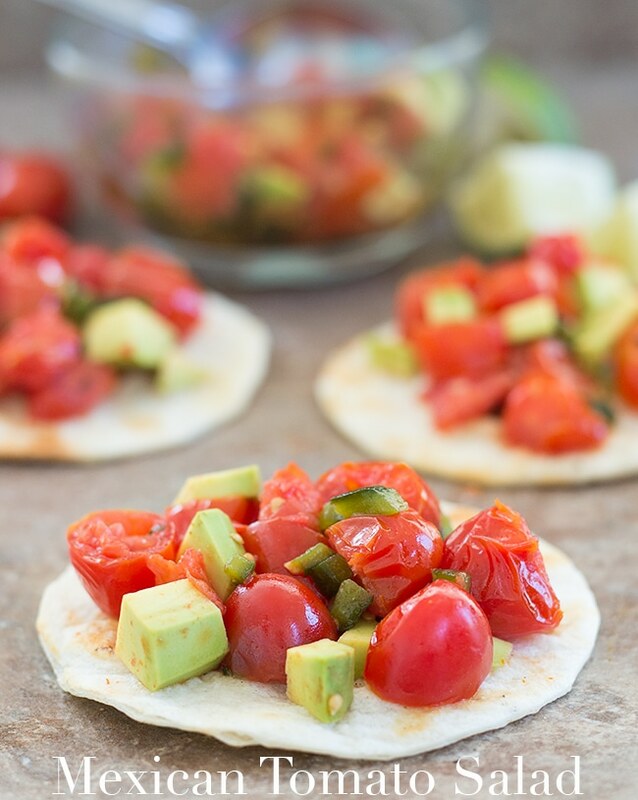 Have you tried mixing tomatoes, avocado and cayenne pepper? 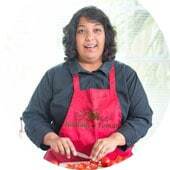 I just tried it and I don’t know why it too me so long to come up with tomato salad idea!! If you are not into spicy foods either, don’t worry. This recipe will still work for you because you can put only a pinch of cayenne pepper into this tomato salad and the taste won’t overwhelm your taste buds. It doesn’t stop with cayenne pepper, though. I also added roasted poblano pepper to this recipe. Why did I add more pepper to this already spicy salad? Contrary to popular believe, poblano is not spicy at all. It is one of the mildest peppers out there. I have found that the bigger the pepper, the less sting they have. Also, the darker the color of the pepper, the milder the pepper. Roasting a poblano brings out its natural juices and also brings down its heat. The roasted poblano becomes sweeter and slightly tangy. Add that to the roasted cherry tomatoes and I have a very yummy tomato salad on my hands. 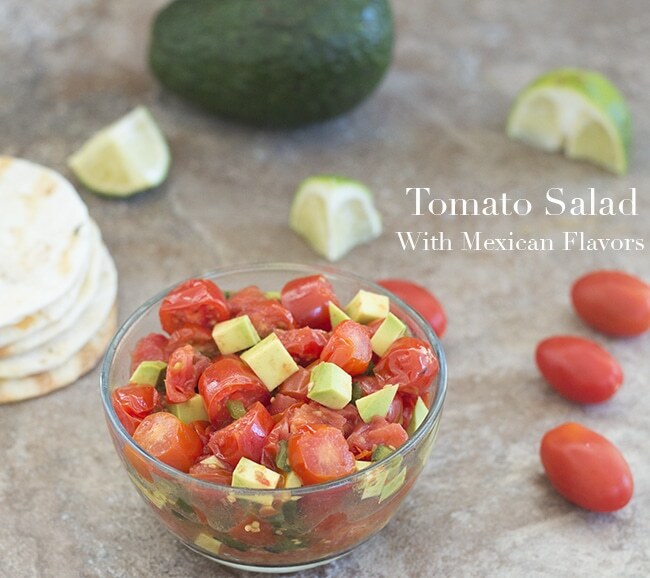 This salad tastes great by itself, but, I tried it on a mini tostada and in a pita bread. Both tasted amazing, especially for a light lunch. If you like tomatoes as much as I do, I have a host of tomato recipes to choose from. My recent favorite is my Healing Tomato soup and my Preserved Tomatoes. The secret to this recipe is using a slightly unripe avocado. Look for an avocado that is not soft to the touch and too hard to chop either. If the avocado gets soggy in the salad, it will take away from the texture of the salad. However, I made this vegan tomato salad to be used as a topping in a very delicious recipe. I think you are going to really like it. It is also a Mexican recipe and I can’t wait to show it to you all! In the meantime, I hope you like this quick tomato salad recipe. If you find creative ways to pair this salad, I would love to hear from you. Your creativity always inspires me and makes me happy. Wash a medium poblano and dry it. Dip a paper towel in a 1 tsp of vegetable oil and rub it on the poblano. Cut 2 cups of sweet cherry tomatoes into halves. Remove the blistered skin from the poblano and cut it into 2 pieces. Add salt, cayenne pepper, garlic and fresh lime juice.